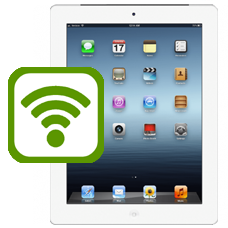 Having troubles with your WiFi on your iPad 3? We can help if your GPS is erratic or unreliable, your GSM reception is poor or you lose WiFi reception. If this is the case our service will fix these issues for you. * Our normal repair turnaround times are 3 - 5 working days. We always aim to complete repairs as fast as possible. This is an in-house Apple iPad 3 repair service, when ordering this service you are required to ship your iPad into our repair centre for works to be undertaken.